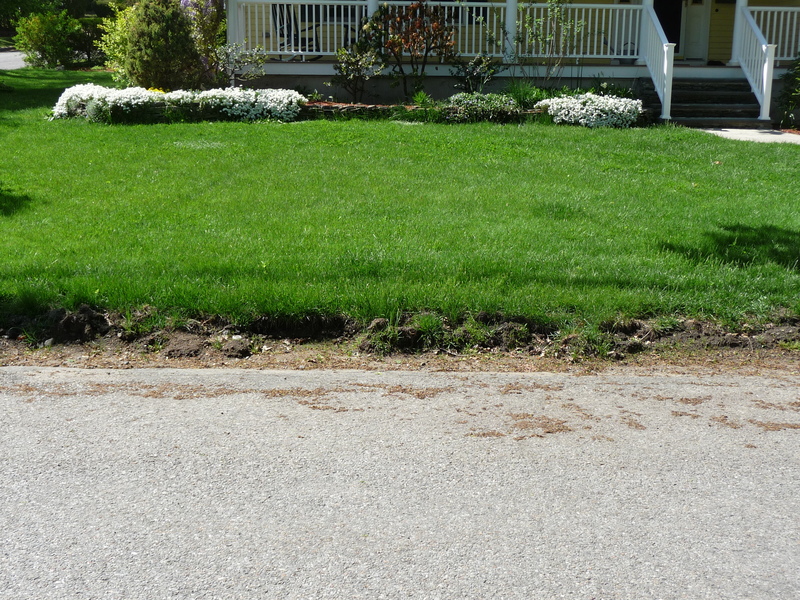 Every winter, the snow plows destroy the front edge of our lawn. Some years are worse than others. The damage this past winter was particularly egregious. Maybe that’s because this was the winter that my husband gave up trying to protect said lawn from said plows. In the past he’s planted white metal rods tipped with a bit of fluorescent paint, at the edge of the lawn to telegraph to the snow plow drivers that there was, indeed, a lawn under the snow. It worked, nominally, but there was still a mess to clean up every spring. If it was just a question of re-seeding, Andrew might have hung in there, but even that turns into the project from hell once you factor in the need to water twice a day. And the reality is, re-seeding alone doesn’t do the trick, because instead of sloping gently down to meet the asphalt, there’s a shorn off strip of lawn that is several inches high. How do you plant grass seed on a vertical expanse? Here’s a picture of this year’s mess. I decided enough was enough and called the town to ask them to put in a curb at our address. The Town Engineer told me that they would love to put in a curb—the next time road work was being done on my street. However, that work is scheduled three years in advance and my road is not on the plan, nor is it likely to get on the next three-year plan either. Why would the town like me to put in a curb? Because then I would be beautifying their property. It seems that we don’t actually own the bit of lawn that meets the road. I’m not sure what the exact measurement of the easement is (I don’t even know if I’m using the word easement correctly), but I do know that the town insists that the curb be set much further back towards the house than where the lawn meets the road today. “I doubt it,” he said. Really? I know we don’t own the road. If the town is dictating how the job must be done, doesn’t it seem fair that they put some skin in the game? I ask that knowing full well that they have us by the proverbial short you-know-whats. If we want to keep our property from being damaged annually by the snow plows, we need to put our money where their maws go. We’ve arranged to have the work done and I’ll be dogging the contractor every step of the way to make sure we don’t give up one iota of lawn that we don’t absolutely have to, and in the end, I’m sure it will be a massive improvement over what you see above. Our pretty property deserves a more appealing curb. But I’m going to ask the contractor to bill separately for the road work so I can continue the discussion with the town. I know times are tough, and the town doesn’t have spare money, but there’s a principle at stake here. If this is something they’d pay for if they were working in the neighborhood, don’t you think they should reimburse us? Please let me know before I make a fool of myself tilting at a windmill. 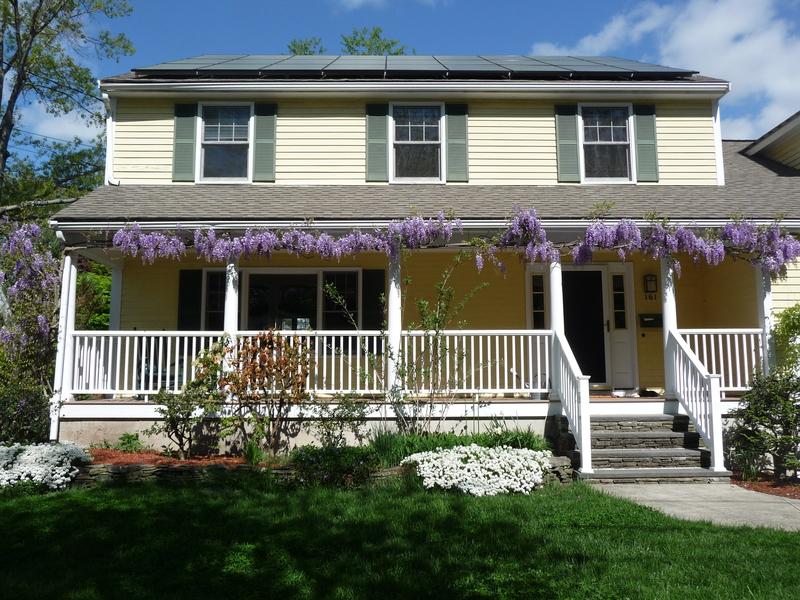 This entry was posted in Uncategorized and tagged curb appeal, easement, snow plow damage. Bookmark the permalink. Alas, Judy, my heart doesn’t bleed. Here in Wardsboro, our snowplows do much more damage. And I fear you are starting down a rocky road that will have no turning. And we’re not talking ice cream here. All I can say is, lots of luck–municipalities are notoriously hard to deal with. Amazing that you posted this on the Arlington List. Rich and I were just talking about it yesterday. We live on a corner. It is uuugggglleee. I am curious to know how much it costs to have an approved contrator provide and install the curb. I suspect it’s not inexpensive. Stop! Do no work until you hire a surveyor to determine exactly where the line between your property and the public way (street) is located. My Arlington house lot ends at the edge of the sidewalk: the sidewalk, the grass strip, the street, and the grass strip and sidewalk on the other side are the public way. If I were you I’d locate the curb about six feet from your property line, leaving enough “public way” for a theoretical future sidewalk and grass strip. Bounce this scheme off the Town Engineer before you start the work. Thanks, Peter. The contractor can’t start until the town approves his plan. He’ll have to do what the town tells him. I’m not afraid of future sidewalks because the town already said the curb has to be at least 18inches from the fire hydrant. I think that hydrant makes a sidewalk moot. But what the heck, I’ll confirm. I don’t want any unpleasant surprises! I’m with you about the dawdling. And I think it should have been Mintzo, not Sanchmintz. What do you think? You’re on a public way, yet you have no curbs or sidewalks? I’m surprised, I thought that was one of the hallmarks of a public way in Arlington? Sure it’s not a private way? Most of the streets in my neighborhood don’t have curbs or sidewalks. We’re up in the Heights. And we are most definitely a public way. Definately have a surveyor map and mark your property line. For example, property lines for the Mass Ave project were last mapped in the 1800’s and yet the work is to be done with only approximate property lines! Check your deed for any easements – fire hydrants, utility poles etc.. No easement, then they have no rights to your property, but can gain them via adverse possession. Sidewalks when added are usually permanent easements on your property, and you are entitled to compensation. Thanks for the advice, Mark.